Old Exchange Buildings is a Grade II Victorian building providing retail and office space in a ‘high value’ district of Manchester city centre. 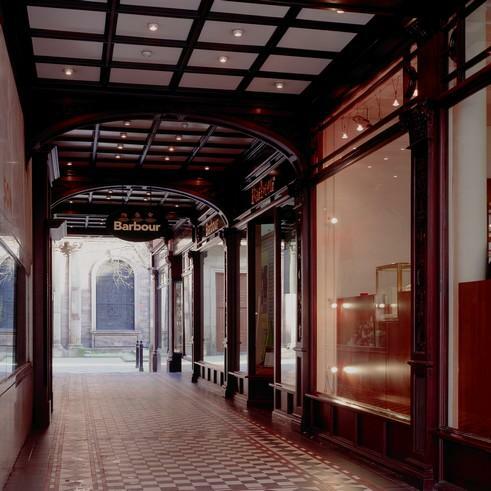 It is important within the cityscape of Manchester, as it incorporates a pedestrian shopping arcade at street level that links King Street with St. Ann’s Church Yard and St. Ann’s Square beyond. This award winning project included the refurbishment and extension of the third and fourth floors, totalling approximately 3,500 sq. ft. The design featured a copper clad ‘wedge’ constructed within the existing light well linking the front and rear of the building and provided space for a board room at fourth floor with views over St. Ann’s Church. Throughout, the original structure was retained and enhanced to provide new, high specification offices whilst the building was in part occupation.